Background: *The first International brand vehicles arrived in Australia from the USA in 1908 and proved popular for both freight and passenger work. The International Harvester Company of Australia Pty. Ltd. was formed in 1912 and was located offices in Bourke Street Melbourne. State offices were later established in Brisbane, Adelaide and Sydney. The first Australian International Harvester manufacturing plant was established in Geelong, Victoria, in 1937. Device: International Harvester were prolific perfin users but most of their IH and IHC patterns are only found on postage stamps. Despite the simplicity of many of the IH patterns the company seemed to go to some trouble to make each pattern different and this is generally achieved by the variation in the structure of the H and the addition, or not, of periods following each letter. This policy of discrete and discernible patterns for each location is also found with the companies IHC logo patterns used in North America in which each office has an additional pin in the pattern to make it identifiable. This policy seems to have been circumvented here, as this IHC device, with its simple single line format, is very similar to a device used in Western Australia. The Western Australian pattern is of a somewhat smaller size. Take care when identifying this IHC and the similar WA pattern as well as other IH patterns as the symmetrical nature of the letters makes them hard to determine what position they are in. If you do not get a match with the Perfin Finder at first then turn the stamp over, as the component letters are not always true in reverse. In all other studies of Australian Private Perfins these IHC patterns from Victoria and Western Australia have been considered to be the same pattern. This is not the case. The smaller WA pattern is much more common and the larger Victorian pattern is only found used over the period around 1938-42. It is a single die device and although only in service from a short period there are many missing pins. Background: *The Insurance Office of Australia was formed in Sydney in 1910 and they initially occupied premises at 263-265 George St, Sydney. The company expanded quickly establishing a London office as well as a presence in the State capitals and central Queensland as far north as Rockhampton. The company focused mainly on fire and accident policies. In 1922 the company undertook some marine underwriting through its London office and this exposed them to considerable loss. At around this time almost all of the shares in the company were acquired by the larger English insurer the ‘North British and Mercantile Insurance Company’ who had held offices in Australia since 1878. However as is often the case with such acquisitions in the Insurance industry the acquired company continued to trade under its own name. At the 1923 Annual Meeting of the company it was decided to close the London office and concentrate on the Australian market. 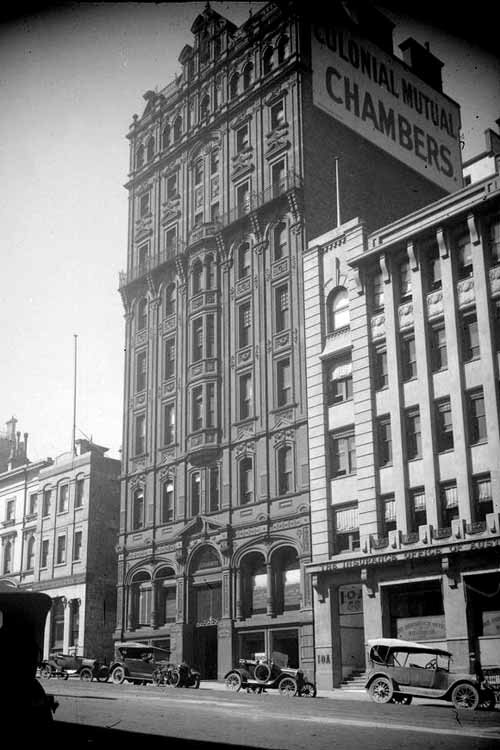 With the backing of the North British and Mercantile Insurance Company the Insurance Office of Australia prospered and in the early 1920’s they opened a large premises at 54-56 Market St, Melbourne. The company remained profitable and continued to grow and after World War 2 they moved to even larger premises at 259 George St, Sydney, NSW which was the head office of the North British and Mercantile Insurance Company. 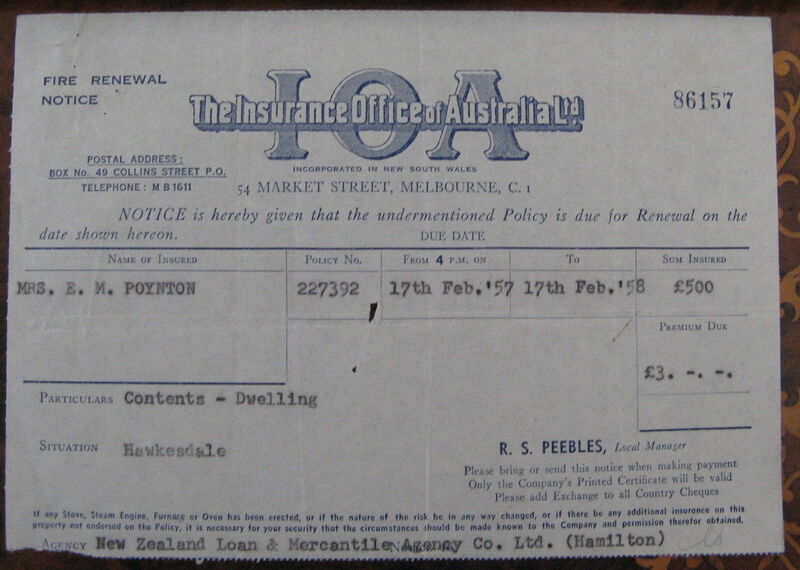 North British and Mercantile and by consequence the Australia Insurance Office were absorbed into the merger of General Accident and Commercial Union that became CGU Insurance. Device: The IOA.a device is a single die device, as multiple strikes show no consistent relationship to each other. Furthermore the device is able to achieve single central strikes on stamps of a variety of formats, including small formats such as the small format Victorian Numeral series, as well as the larger format postage stamps such as the 1930 Commemorative issues of Australia. The pattern is found on the revenue stamps of Victoria but also on the postage stamps of Australia over the period 1923 until at least 1946. 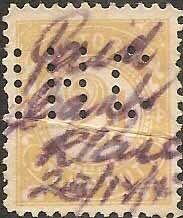 The device was quite wide in its layout and as a result it is most often found in sideways positions on issues such as the KGV postage stamps. 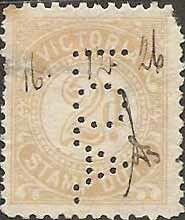 This procedure continues through the KGVI postage stamps as well as the strikes on revenues stamps and these sideways strikes predominate. Late usage of the device in 1946 shows it still in relatively good condition with just a few missing pins so it is difficult to understand why it was removed from service.